2018 has arguably been one of the most transformative years in migraine, from revolutionary treatments to worldwide awareness. We’re recapping some of the most exciting moments the migraine community saw in 2018, as well as the Association of Migraine Disorders’ biggest successes. 2018 became the year of regained hope for many, with the introduction of three CGRP antagonist medications designed specifically for the treatment of migraine. Three different CGRP Antibody medications received FDA approval and hit the market in 2018: Aimovig, Ajovy and Emgality. The new drugs are designed to block the action of CGRPs and presumably prevent a migraine before it begins. Coined “the potential game-changer in migraine prevention”, CGRP inhibitors did not disappoint with minimal side effects and 50% of responders achieving a 50% reduction in the frequency and severity of migraine. This past year was the first full year of our Shades of Migraine podcast. In 2018, we added 13 new episodes, covering various topics from different perspectives. To name just a few, Dr. Stewart Tepper answered many of our questions on CGRP-blocking medications, Dr. Shivang Joshi gave a presentation on using cannabinoids for treating migraine, Jaime Sanders shared her 30-year journey with migraine, Mark M. candidly told his very personal story about life as a cluster headache patient. Using the perspectives of patients, professionals, caregivers and advocates, the Shades of Migraine podcasts helped shape the understanding of migraine. 2018 marked the second year of the Shades for Migraine campaign, an initiative to raise awareness for migraine disease on a global level. Giving light to a dismal situation, we asked participants to show they care about migraine disease by wearing a pair of “shades” all day long on June 21, the longest day of the year in the northern hemisphere. To spread the word, supporters were asked to share a photo wearing sunglasses on social media and challenge their friends to do the same. 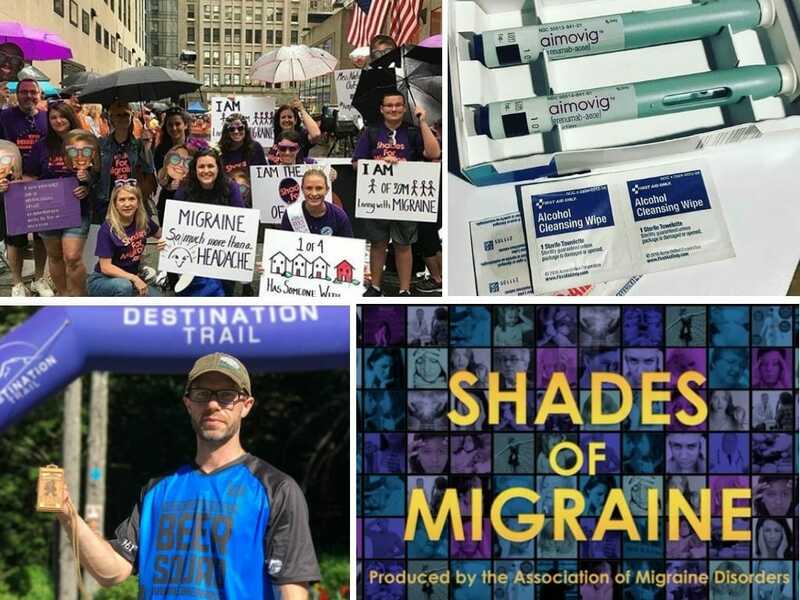 With the help of more than 1,300 participants and over 30 participating organizations and bloggers worldwide, the Shades for Migraine campaign grabbed the attention of over 2,600,000 people across at least 16 countries. In June of 2018, Elle magazine released an article about the “Migraine Pose”, adding to the stigma people with migraine face and minimizing their disease to an Instagram trend. The migraine community fought back in a series of posts displaying the #TrueMigrainePose to put an end to the trend that made light of a debilitating disease that impacts more than a billion people worldwide. The community stood together to make a change and educate with a Change.org petition signed by more than 3,000 people and an open letter by AMF to Elle’s Editor-in-Chief. In August of 2018, Dearric Winchester, long-distance runner and husband of a migraine patient, took on the 216-mile Cascade Lakes relay by himself in an effort to raise awareness and funds for migraine disease. His remarkable endeavor caught the attention of many people, increasing the overall awareness of the disease. In addition to awareness, Dearric and his family have raised more than $4,000 from this and previous races to donate to the Association of Migraine Disorders. We give major kudos to Dearric for his dedication to his wife and to the disease. The first module, “Diagnosis” is currently available as a free online course for CME credit on MyCME. The second 2-hour course “Treatment” will be released in January and the final two modules covering Specialty Care, including Pediatric Migraine, Urgent Care, Medication Overuse Headache, Vestibular Migraine, Cluster Migraine and Hormone-related Migraine Issues will be available in February. The online course is a unique educational product designed to engaging a broad range of medical professionals in the management of migraine. We are proud to share that the Association of Migraine Disorders’ named $50,000 grant with the Migraine Research Foundation was awarded to fund a research study titled, “Virtual Method for Assessment and Treatment of Chronic Headache(V-MATCH)”. Funding was granted to Dr. Zubair Ahmed of the Cleveland Clinic. Dr. Ahmed’s study is currently underway and will compare the V-MATCH pilot telemedicine program with the established I-MATCH program of in-office visits to assess whether the telemedicine program is a viable and effective alternative to treat migraine patients. The Association of Migraine Disorders strives to expand the understanding of migraine and its true scope by supporting research, education, and awareness. In addition to our new mission statement, we will be re-launching our website, enhancing the design, content and organization to create an inviting and educational experience for our audience. There are several new medications close to market release. Some of them to keep an eye out for are levetiracetam and lacosamide, melatonin receptor agonists (e.g., ramelteon), glutamate receptor agonists (e.g. memantine), tonabersat, IGF-1 Insulin-like growth factor-1, topical prostaglandin (latanoprost) and several novel neuromodulators. In 2018, Biohaven Pharmaceuticals saw positive outcomes in their phase 3 trials for new drug, Rimegepant. Rimegepant is an orally available, selective and potent small molecule CGRP receptor antagonist. A New Drug Application is expected to be filed this year. To continue our mission to educate people on migraine, we will be expanding our annual Migraine Awards Dinner to include a Migraine Symposium led by over 25 experts and advocates in migraine. The symposium will consist of 2 sets of lectures, covering various hot topics in migraine, including New Innovations in Care & Research, Clinician & Patient Perspectives, Vestibular Migraine, Sinus Pain and Hormones & Migraine. One of the lecture series open to the public and another tailored to medical professionals and students. The night will conclude with a networking and awards dinner to embrace further discussion on migraine and to honor those making a difference in the community. For more information on the event, please visit amdfundraiser.org. 2018 was just the beginning of a string of growth for the migraine community. Using the successes of 2018 as motivation, we look forward to making an even bigger impact in 2019. Sign up for our newsletter to stay updated on the new developments 2019 brings.